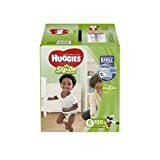 HUGGIES Little Movers Slip On Diaper Pants Size 6 fits babies over 35 lbs. With the stretchy fit waistband for baby's comfort, easy remove tabs and pull on style for quick changes, these are perfect for when your little one is just beginning to walk. 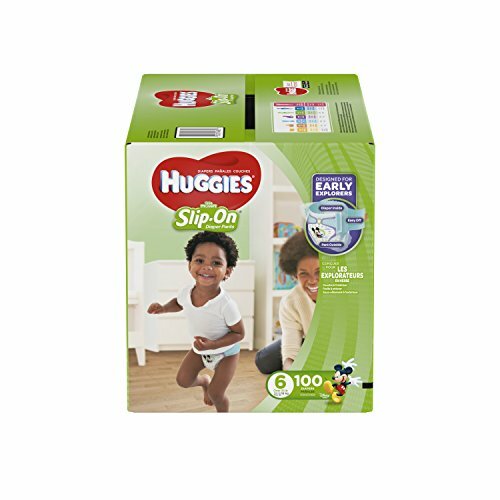 HUGGIES slip on diaper pants move with your baby and absorb quickly, giving total coverage and leak protection during your baby's naturally active play and keeping them dry and comfy. Unswaddle baby and set them free with HUGGIES Little Movers Diapers. Like a pant on the outside but a diaper on the inside, slip on diaper pants with removal tabs make changing easy whether baby is lying down or standing up. HUGGIES knows nothing is more important than how a diaper feels against your baby's sensitive skin. The LeakLock system keeps your baby clean and dry and provides up to 12 hours of leakproof protection. Stretchy sides give your baby a great fit. A dry, snug fitting diaper keeps your walking baby's sensitive skin safe from chafing while they explore. Pack your diaper bag with Little Movers Slip On Diaper Pants for long lasting dryness and comfort on outings, whether you're traveling on an overnight trip or taking a trip to the zoo. From their first smile to their first step, HUGGIES is here to help.